Matthew Charles and Naomi Tharpe, a friend and supporter, pose with President Donald Trump in the Oval Office. Viewers of the State of the Union address last week may have taken note as President Trump spoke about one particular guest in the gallery: Matthew Charles. Charles was the first person released under the newly signed First Step Act. The bipartisan reform bill was signed into law by President Trump in December. Before then, there hadn’t been a significant change in federal sentencing laws in almost a decade. Charles’s appearance served as the final chapter in a saga that began with his release from prison in 2016, his return to prison last year and re-release in January. His story has made him one of the faces of criminal justice reform. The day after the State of the Union was a flourish of meetings, invitations and speeches. He did a Q&A at Georgetown and was rushed in and out of interviews with national media outlets. “The door of opportunity has been opened since my release to be able to speak and be heard by people that are interested in my story,” he said over a meat-lovers pizza in a Washington, D.C., hotel room, a rare break in his busy schedule. Charles is still getting himself back on his feet. When he returned to prison last summer, he was forced to get rid of everything he worked hard to built since his release in 2016: He gave up his job, car and apartment. He even gave away most of his clothes and belongings. When he got out again last month, he says he tried to juggle both his need to work and rebuild his life with the responsibility he felt to speak out. Last week, Families Against Mandatory Minimums, one of the organizations that was pivotal in passing the First Step Act, came up with a solution: They hired Charles as an advocate to travel the country and tell his story. While Charles would like to see a federal "Next Step Act," he says much of his focus over the coming months will be meeting with lawmakers seeking to change laws at the state level. After all, that’s where most incarcerated men and women are serving time. Charles has a lot of ideas borne from the two decades he sent behind bars — much of that time working as a law clerk, assisting others with their own cases behind bars. Charles would like to see other alternatives to prison be considered, like mental health and substance abuse counseling. He’d also like for all future policy changes to automatically be made retroactive. He says the biggest flaw of the Fair Sentencing Act of 2010 was that it took the First Step Act to free people like him, who were used as a reason for passing reform in the first place. But one of his biggest goals is reducing over-sentencing. 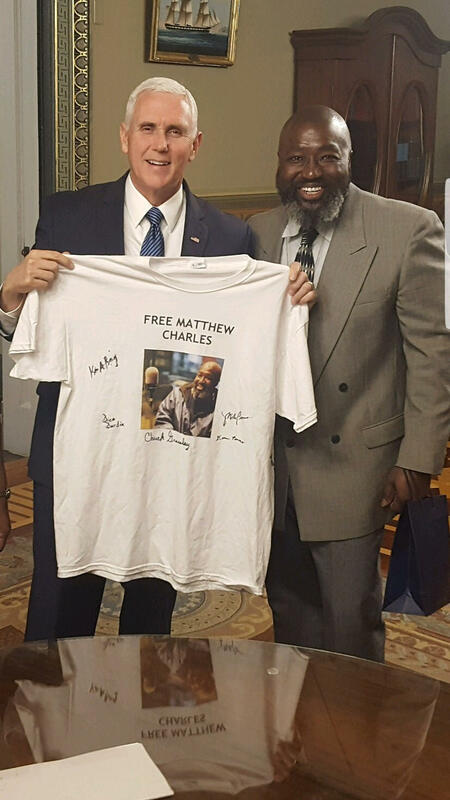 Vice President Mike Pence holds a T-shirt signed by several Republican lawmakers who supported Charles' release. He’d like to see the creation of a mechanism for those who are serving decades behind bars to have their terms reviewed after 15 years. Charles admits that it can be difficult for society to change how they look at the purpose of the justice system — from punishment to rehabilitation. He says change is hard but necessary. He’d know.